The adverse effects of climate change will be felt more in the South than the North. If preference for fossil fuels like coal, oil and gas is not curbed, developing nations will have to bear the brunt of an environmental catastrophe. 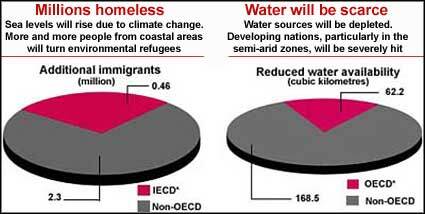 While the developed nations of the Organisation for Economic Cooperation and Development (oecd) continue on a comparatively prosperous note, adverse impacts of global warming will severely affect life and livelihood in the poor countries. Moreover, if current scientific predictions come true, South Asia -- which has over one-sixth of the world's population -- will suffer more than any other region in the world.